MIRO's processing stack comprises three layered processors known as P1, P2, and P3. P1 and P2 both run provided firmware, whilst P3 runs a Linux operating system and is available to run user applications. User applications can, alternatively, be run off-board, communicating with the MIRO platform through a USB-to-WLAN bridge that can be set to run on P3. The Biomimetic Core is distributed across P1 and P2. We loosely associate P1 with "spinal processing" and P2 with "brainstem processing", and—in consequence—sometimes refer to them as the "spinal" and "brainstem" processors. Spinal processing includes upstream and downstream signal transforms, and low-level reflexes; brainstem processing centres on spatial processing, sensory fusion, high-level pattern generation and action selection. Since P3 is intended to be the substrate for the highest level of control system, we sometimes refer to it as the "forebrain" processor, though its actual control role will depend on how it is used in any given application. Consistent with this naming scheme, we use the label "P4" to refer to any off-board processing linked in to MIRO's control system. 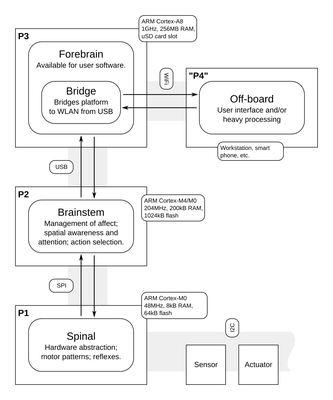 P1 (STM32F030C8) is MIRO's "spinal" processor; it runs the lowest-level components of MIRO's brain model. P1 exchanges signals with peripheral boards on the I2C bus, drives the speaker, and links these into MIRO's wider processing architecture by talking to P2 over an SPI link. 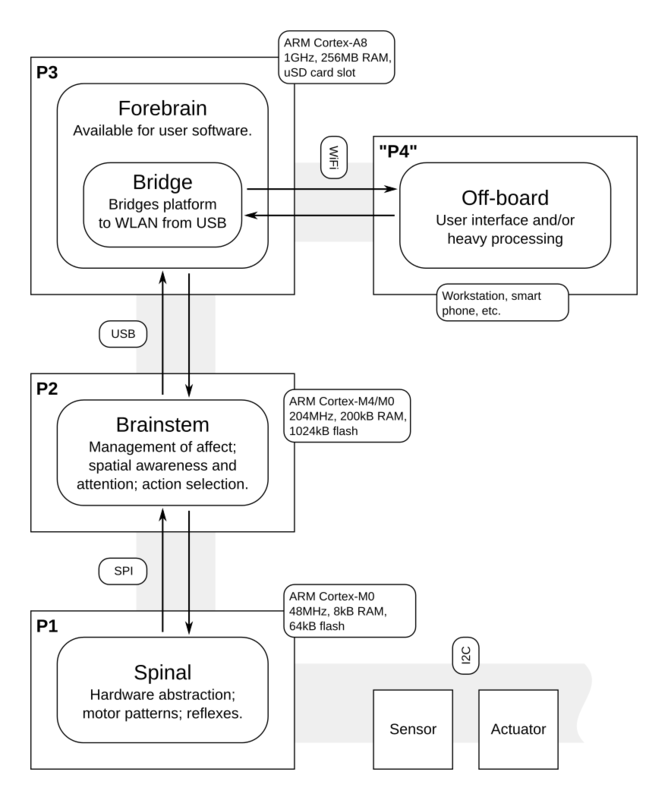 P2 (LPC4330) is MIRO's "brainstem processor". It is responsible for running the brainstem component of MIRO's brain model. P2 acquires signals from MIRO's eyes (cameras) and ears (microphones), maintains the real-time clock when MIRO is switched off using power from a coin battery, and links into MIRO's wider processing architecture by talking to P1 over SPI and to P3 over USB. P3 (AM3358) is responsible for running high-level software provided by the user, or for acting as a bridge between P2 and the wireless network (or both). P3 links into MIRO's wider processing architecture by talking to P2 over USB and to the wireless network through its WiFi module.